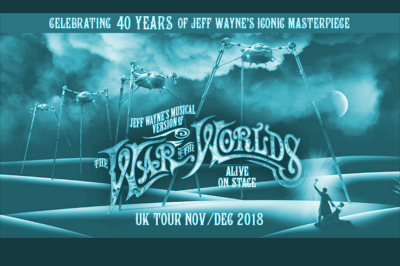 Get ready for a brand new arena tour production of Jeff Wayne’s War of the Worlds, landing at the SSE Hydro Glasgow in 2018. The martian overlords are heading to our favourite arena venue on Friday 30 November 2018. Based on the classic HG Wells novel, Jeff Wayne’s musical version has been a constant hit since the 70s. After numerous stage versions and live tours, this latest production boasts impressive CGI, an all star cast and those impressive alien tripod craft, backed with orchestral and rock band music.